I came across a four row LCD panel while browsing at an electronics store: the model name was WM-C4004A. I wasn't sure if I could drive it through an Arduino but decided to try. It was easy to drive once I hunted down the datasheet for the WM C4004A, a dual HD44780 controller, and understood the controller. There is a good Arduino library for driving HD 44780 compatible controllers and I modified the LiquidCrystal library to drive two separate controllers. The usage is identical to the LiquidCrystal library. You specify the Register Select (RS) and enable bits for both controllers, the data pins, and the rows and column per controller. 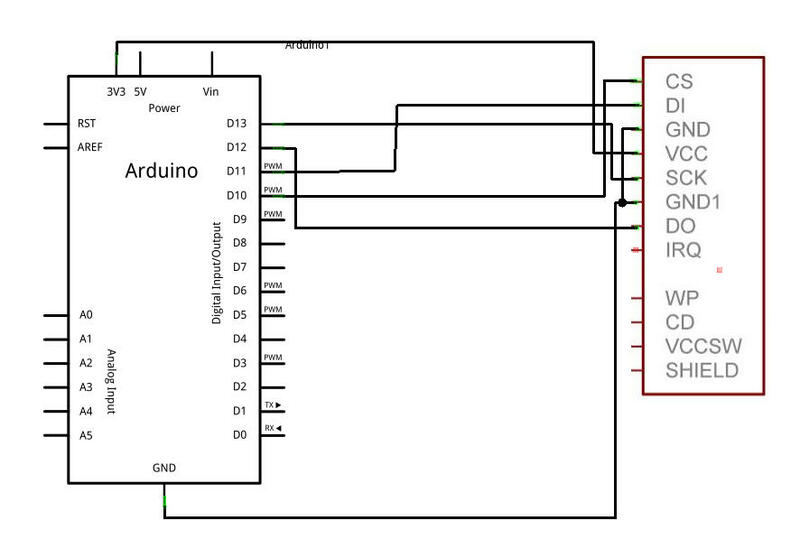 Then you can seek() and write() through Arduino. My modifications are available as the LiquidCrystalDual library. Download the library: LiquidCrystalDual.tar.gz or LiquidCrystalDual.zip. Unzip and place the contents in the libraries/ directory in the arduino installation. 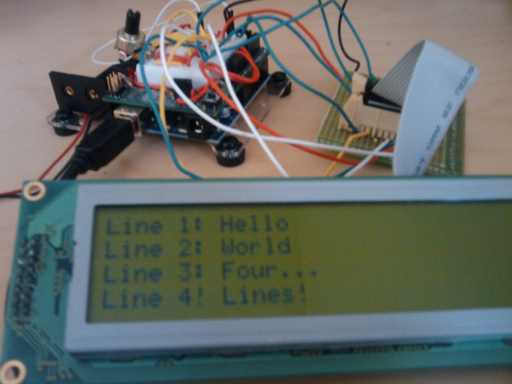 Here is a small example program (there is a detailed program in the examples/ menu in the Arduino IDE). // I have 40 characters and two lines per controller. // Move to the first column of second row. If you've been playing with microcontrollers, or hacking any sort of hardware, you know that it is great to be able to communicate with a computer. A usb cable is often the best option, since usb serial drivers are ubiquitous and easy to work with. However, cheap usb cables are difficult to come by. 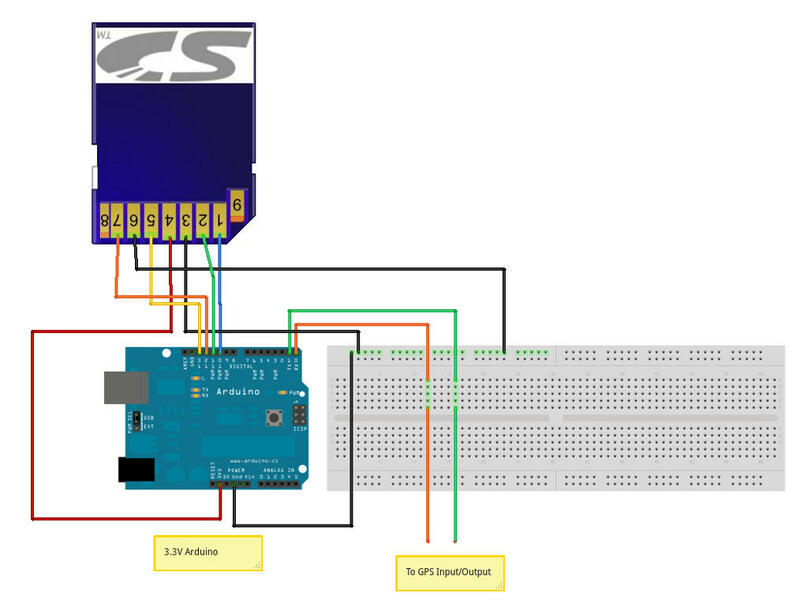 On this page, you will find instructions to build a very low cost USB serial cable, which can also supply +5V to a board. 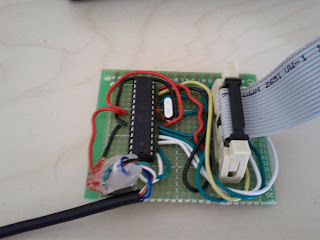 This is ideal for breadboard arduinos, but will also work great for any microcontroller or TTL circuit. All instructions here are provided solely as a guide. If you miswire the cable, you might end up burning your computer, your electronic gadgets, or your house. I do not take personal responsibility for your actions. You need a Nokia CA-42 cable, a soldering iron and some method of determining continuity. A multimeter would be handy, but is not required. Assuming you have the tools, the CA-42 cable sells for $3 including free shipping from many sellers on eBay and Amazon. Since the cost of the cable is so low, online fraud is unlikely. The total cost of the project is $3, and you don't need any extra parts. The final cable works on Linux, without requiring any extra drivers. 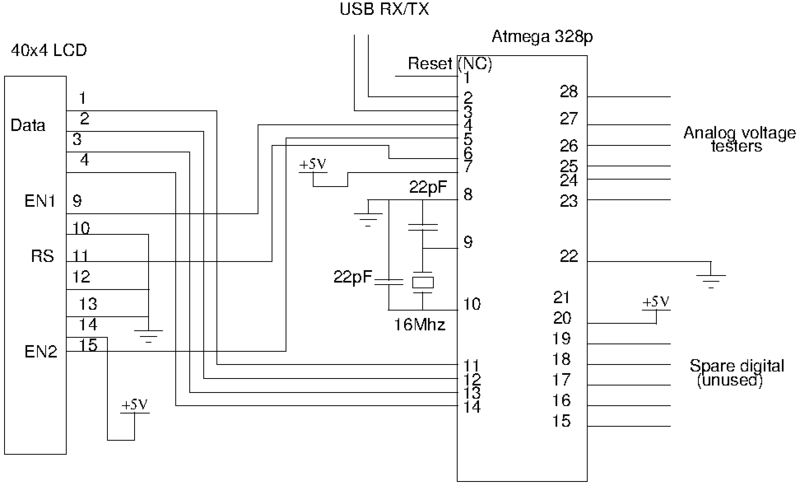 Most cheap CA-42 cables are made using a PL-2303 chip, which is a cheap RS232 convertor. For data transmission, you only get two lines: RX and TX, but this is usually sufficient. You get +3V and +5V, which are very well regulated and clean sources of power. These could be directly attached to microcontroller boards. I have seen drivers for PL-2303 on Windows and Mac, and you should search for these over the Internet. You might need to mask the device ID, since the cable might announce itself as a Nokia phone cable. You don't need any drivers if you only want to use the cable as a power source. It might help to view the pin out diagram (hosted at nas-central.org). Now, the cable has five wires: two are used for data (TX, RX), two are for power (+3.3, GND). There is an extra wire in there, which is useless for our purposes. 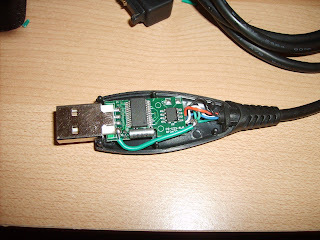 So we repurpose this wire to carry the +5V connection from the USB port. In my cables, this wire has always been green, though you should check which wire, if any, is unused in your cable. The head of the cable comes off quite easily if you hold it and twist the metal USB connector as though it were a key. Connect the far right metal lead from the USB connector to the green wire. The green wire should be disconnected from the body, but the +5V connect should not be disconnected from the body: the PL-2303 requires +5V power to work. Here is the final soldered assembly. In this image, the usb connector is the correct side up. 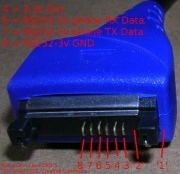 For your reference, here is pin-out for the USB A connector. The soldering is done to the +5V wire. 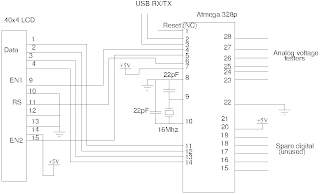 The +5V and ground can be used to power an arduino or most Atmel Atmega AVR microprocessors. 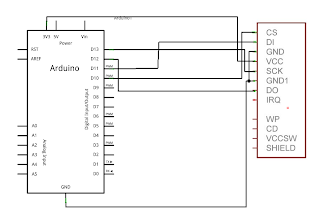 The TX wire (colored blue in my cable) goes into the TXD pin of microcontrollers (Arduino: digital 1), and the RX wire (colored white in my cable) goes into the RXD pin of microcontrollers (Arduino: digital 0). I've tested the power using an oscilloscope: the power in my cables is very clean. This means that you can avoid using a 7805 and other circuitry that would provide a clean +5V signal. 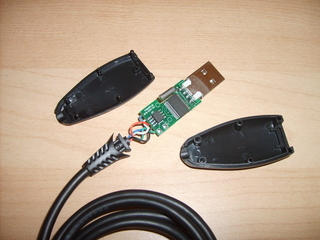 Credit: The idea for this cable is due to the the ARM9 Linkstation hackers. This is Part 2 of programming the Lego NXT using Linux. Part 1 covers the Lego-Linux bluetooth connection. If you're like me, you've used the graphical NXT programming environment for about twenty minutes before wrist pain and frustration sets in. I did not enjoy the graphical programming at all, and the fact that it did not work on Linux was another factor. Well, there is a very nice alternative, which is John Hansen's NXC language. It is a C-like language which you can program the NXT in. You'll hear a lot of references to BrixCC, which is an IDE for NBC and NXC. It doesn't exist for Linux, but any text editor works quite well. All features are supported, and you can write code that is more compact and faster than the graphical tool. Also, you can use NXC to allow your robot to communicate with your Linux computer over bluetooth! This is what you need to do to start using NXC. Visit the excellent NXC beta release page . There is no stable release as of March 2009, but the beta is pretty rock solid. Forget the source code, it is made in Delphi and there is little documentation on how to compile it under Linux. Get the binary distribution. It consists of some very spare documentation and the nbc executable. Despite its name, it is also the NXC compiler. This will only work on x86 Linux. Run nbc -help to learn the options. Really, this program needs a man page! Visit the NXC documentation page and get the lovely NXC_Guide.pdf, a guide on how to program using NXC. Download it but don't look at it yet. It is a reference, not an introduction. The real document you're looking for is Danny Benedettelli's NXC tutorial, which is far more useful than the guide. Download it, print it out, read it through and through. To set up the USB communication, download setupNxtUSB.sh: shell script to perform USB settings for Linux communication with NXT. This will prompt you for the root password when required. The file follows instructions from the page about Linux USB setup with NXT, so all credit to them. Feel free to edit the file if you suspect something went wrong. The script will prompt you with any errors that it encountered. Write a sample program using Danny's guide. Compile your program with nbc your_program.nxc -d -S=usb, where your_program.nxc is the name of your program. Now the program has been compiled and loaded on to the NXT. It should appear in the "My Files" -> "Software Files" area of the NXT, from where you can run it! There, that wasn't so hard! As you learn NXC, you'll realize that it is feature complete, and is a much more elegant way of programming the NXT. So you want your NXT device to talk back to your Linux machine? Perhaps you want to control your robot through your computer. As a first step, you have to set up the Linux - NXT bluetooth connection. My setup is explained below. Ubuntu Gutsy (7.10) Linux, though these instructions are not version dependant. The only instructions that depend on the distribution are the ones related to package installation (apt-get). If you know your distribution's package manager, you should have no trouble. An x86 computer. Typically, you'll want a laptop with bluetooth support, so you can walk around with your NXT construction. A desktop will do just fine too. You need an x86 because the nbc binary only works on an x86. Bluetooth hardware on your linux machine. Make sure you have all the packages installed. On Ubuntu, you can run this command. Now, once all the packages are installed, make sure that your bluetooth hardware is supported and is running fine. One way to do this is to check for the bluetooth icon in the taskbar of Gnome. Now that you have a working bluetooth setup, you need to pair it with the NXT brick. 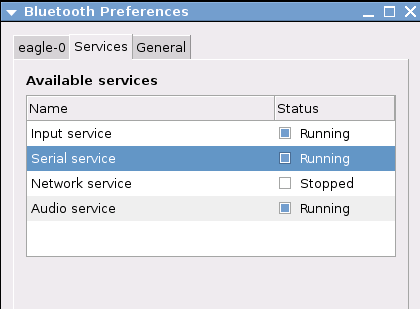 First, you need to ensure that the serial service is started by selecting it in the preferences dialog from the bluetooth icon. Now turn on your NXT Brick, and enter bluetooth settings, and turn bluetooth on. You can verify that bluetooth is turned on by looking in the top left of the NXT display. It should have a bluetooth icon. Now run the command sudo hcitool scan from a console. The output should contain a line for your NXT device. 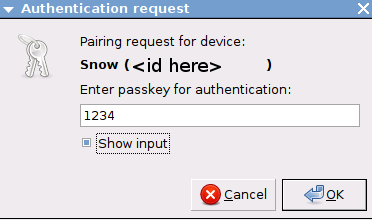 My device is called Snow, and I get the following output. This will prompt the NXT to beep happily, asking for a passphrase. The number "1234" is already entered, so just accept it by pressing the orange button. Now your computer will want to know this passphrase. Click on the button in the notification that pops up (example shown below), and enter the same number as shown. This is a one-time procedure for each computer-NXT combination. If you have a multi-seat (or multi-terminal) setup, this notification might be going to another seat, so check all notification areas on every terminal. If you don't know what multi-seat or multi-terminal setup is, ignore the previous statement. If all went well, your ping command should be able to send packets back and forth to the NXT. A happy sample output is shown below. Great! So now your NXT is paired with the computer. In order to communicate with the desktop, you need to download the NXT Python library. Once you have downloaded and installed it, enter the sample program, and you should be able to get the NXT's name and ID. If you have any problems at this stage, try rebooting the NXT brick, it sometimes helps. After running the sample program, you should see your hostname in the "My Contacts" in the NXT's bluetooth menu. This verifies that you can connect with the NXT, and have the NXT talk back to the desktop computer.